I’ve thought about Sloane so much since I finished that book and wondered what happened to her and Rhys? 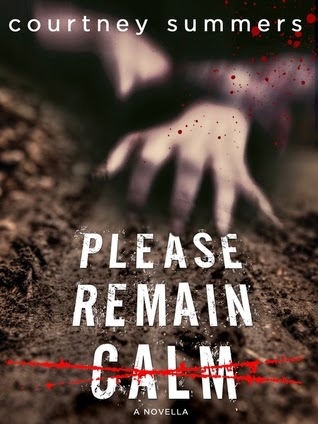 I was so excited to read Please Remain Calm and finally have those answers. The best part of this novella is that we pick up exactly where we left off, and this time around we are in the head of Rhys. This poor guy is doing his best to keep them alive, and it’s not easy when you’re not sure your partner in survival is as intent on the whole surviving part as you are. All I can do is hope that this amazing author will give me more of this story and these characters one day. Gahh I have to read This Is Not a Test! I snagged in it one of my many book outlet sprees and now it is just waiting patiently for me on my shelf. I love this review wifey! I've been meaning to read This Is Not a Test for quite a while now. Now I know I really must get to it! With how much you seem to enjoy the characters that the author created let's me know I have to get lost in the books! Doesn't she rock. I hope you read her newest All the Rage as well Michele. I keep thinking I need to read this, but I am waiting for more because I don't want another open ending. This author rocks! Isn't she amazing? But, yes... those open endings. This seems to be a trait of hers. I will say she does them in such a way they leave me with a hopeful heart and usually a smile on my face. I need to read this. I loved This is Not a Test and want to know what happened to them.